The Geohazards Lab is an initiative developed under the CEOS Working Group Disasters to enable a greater use of Earth Observation (EO) data and derived products to assess geohazards and their impact. The aim is to establish an inclusive and comprehensive process to optimise the use of EO technologies with a primary focus on hosted tools and services to exploit satellite data on the Cloud. The activity is driven by the needs of national and local decision-makers in policy sectors linked to Disaster Risk Reduction (DRR) that are concerned with terrain motion and geohazards. The Geohazards Lab is looking at using interoperable platforms with the aim to strengthen the federation of resources for EO data access and hosted processing as well as to support and animate the user community. It is a collaboration between the European Space Agency (ESA), the German Space Research Centre (DLR), the Italian Space Agency (ASI) and the French Space Agency (CNES) alongside with ‘in-sector’ EO experts from R&D organisations and geoscience centres such as CNRS EOST and BRGM in France, CNR IREA and INGV in Italy or IGME in Spain. Geoscience centres are the intermediaries with end users from local and regional DRR organisations and the rationale of the Geohazards Lab activity is to take advantage of the expertise of in-sector EO experts to expand the level of expertise in EO within this community. An example of a precursor system available in the framework of the Geohazards Lab is the Geohazards Exploitation Platform (GEP), developed in the framework of the ESA Thematic Exploitation Platforms (TEP) initiative and is available since 2016. The Geohazards Lab activity is building on a collaborative framework linking expert geoscience centres and users together with EO service providers of the geohazards sector. To facilitate and promote use of EO techniques with geoscience centres in regions where the level of awareness and acceptance of new EO techniques is less advanced the Lab provides access to different types of EO data and EO processing chains with both high quality specialized services and, as much as possible, open and free solutions. In addition the a this collaboration is looking at consensus methods in liaison with EO practitioners and experts to harmonize processing results and to explain and demonstrate the benefit of satellite EO in the assessment of geohazards phenomena. Beyond space agencies providing access to hosted services using satellite EO, the Geohazards Lab includes the Geohazards Office, an activity co-funded by ESA, CNES and BRGM and started in spring 2018 to liaise with the community and look at methods and standards. 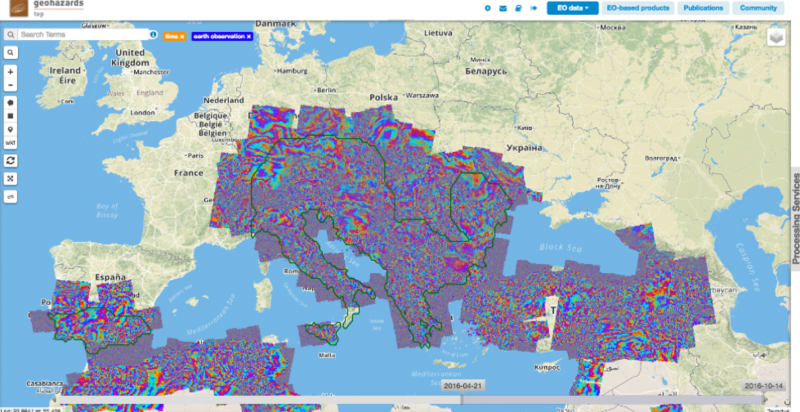 DLR Sentinel-1 InSAR Browse at Medium Resolution over Europe. Contains modified Copernicus Sentinel-1 data. Surface Temperature Map over the Galapagos Islands, Ecuador on 2018/11/02 (INGV STEMP). 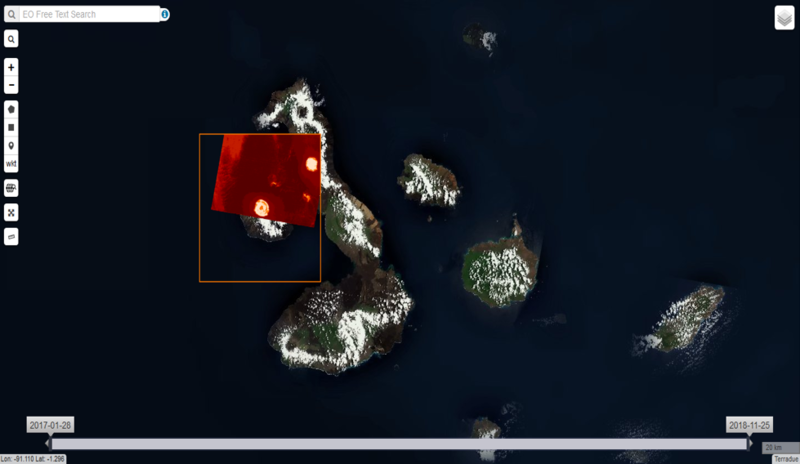 Hot temperature is visible in bright white-yellow in the crater of two volcanoes on the Fernandina Island (west) and on the Isabela Island (east). Contains modified Copernicus Sentinel-2 data.